Minneapolis-based Brewery Increasing Distribution to Nine States. Minneapolis, MN (August 28, 2017) – Minnesota’s Fulton Beer is excited to announce that it has expanded its distribution to Kansas, adding to its already impressive Midwest offerings in Minnesota, Wisconsin, Iowa, North Dakota and South Dakota. Fulton is equally excited to announce that in the coming weeks its beer will be arriving in New York, with Florida and Pennsylvania soon to follow. The brewery’s successful Kansas debut was made possible by Artisanal Imports, which acts as its sales, marketing and compliance partner. Wholesale distributor World Wide Beverage (WWB), which identified strongly with the Fulton brand, has come aboard as its distribution partner in the state. Fulton now offers many of its year-round staples to Kansas, along with seasonal offerings and special releases. These include year-round selections – 300 Mosaic IPA, Standard Lager, Sweet Child Of Vine and Lonely Blonde Ale in 16-ounce 4-packs and draft, with Hopstar NE Session IPA soon to follow. The first limited release will be Specter NE IPA in October, along with choices from Fulton’s Culture Project Series in 750ml bottles and a variety of one-off drafts. World Wide Beverage set up more than 15 events for launch week in Kansas City, Wichita, Lawrence and Topeka. Along with communication, a successful rollout requires knowledge of the home turf. Shovein expects that new palates will result in different sales than in Fulton’s home market of Minnesota, where Lonely Blonde Ale reigns as the company’s top brand. Further south, its hoppy lineup may climb the bine towards the top position. Interested in selling Fulton Beer at your restaurant, bar or retail store? Interested in becoming a distribution partner for Fulton Beer? Please contact Lanny Hoff for details. For interview opportunities with Fulton Beer national sales manager Corey Shovein, or for more information about Fulton Beer and its world class ales and lagers, please contact Lanny Hoff at +1 (612) 245-5433 or by email at lanny.hoff@artisanalimports.com. About Fulton Beer: Fulton Beer was founded by four homebrewers in a Southwest Minneapolis garage in 2009 with the mantra “Ordinary Guys Brewing Extraordinary Beer.” Since then, it has become one of the fastest growing breweries in the Midwest. In 2012, Fulton opened its first taproom in Minneapolis, which offers an ever-changing tap selection as well as house-brewed non-alcoholic soda. It commissioned its second brewery in 2014, a 51,000-square foot facility in Northeast Minneapolis. 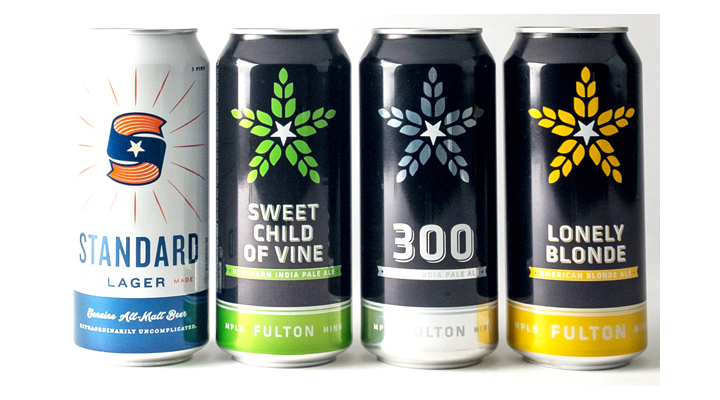 Fulton is best known for Sweet Child of Vine, a balanced and approachable India Pale Ale, Lonely Blonde, an easy-drinking Blonde Ale, 300, a Mosaic IPA, and its newest year-round; an extraordinarily uncomplicated Lager named Standard. Learn more about the brewery at www.fultonbeer.com. Why Should I Buy, Sell, or Drink Imported Beer?